Maharojgar, Skill Development and Entrepreneurship Department, Government of Maharashtra. Job Seeker can get instant Maharojgar Melava as well Current Job Recruitment Notification from this site. Dear Job Seekers, want to get jobs in Government or Public Sector? Get All Maharojgar Recruitment News on maha sarkar. Click ‘Job Seeker ’Tab and then‘Register’ button to proceed for Registration. Before you begin Registration, please ensure that you have Aadhaar Number and Mobile phone with you for verifying your registration details. Note: You can also get alert from this site on time to time. 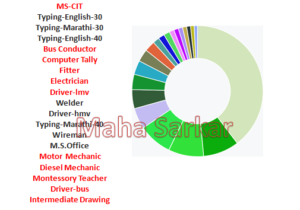 Looking for Jobs in Maharashtra, good then find Sector wise, District wise, Education Wise, Skills wise Recruitment Notification from mahasarkar.co.in.